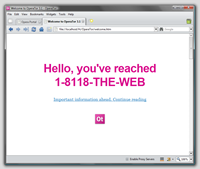 OperaTor is a portable browser for browsing the web anonymously, it is based on Opera and Tor and Polipo. If you prefer anonymous browsing with a portable browser so that you can use it from your USB stick check out OperaTor. The archive file is 7MB download, once downloaded unzip it in your USB drive and use it. There is no install, just click the icon to open the browser. I read this at DS, but didnt try it, any reviews on it? It is slow and needs to adjust ports, turn off firewall etc. 🙂 nice post you have, i already try this browser. My opinion, i am still prefer using firefox portable. Beside that, this operator doesnt stable enough.